Mrs. Ethel Mahaley of Deltona, Fl peacefully entered into rest at 99 on February 24, 2018 in Michigan.Please feel free to to leave your condolences for the family. 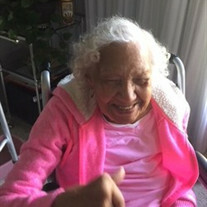 The family of Ethel Mahaley created this Life Tributes page to make it easy to share your memories. Send flowers to the Mahaley's family.